Spring will be officially here, soon! But.... in San Diego, temperature is already touching 92! Can you believe that?! Feels like we have just jumped Spring and have entered straight into summers!! 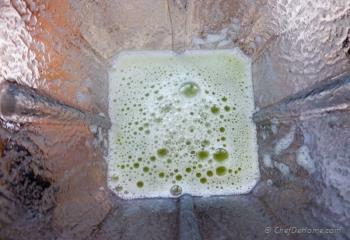 To tackle the scorching heat, today, I blended some cucumbers, lime and basil for a cold refreshment. I'm not so much into desserts, so thought to share this, my style of sweet-refreshment, with you all! Plus color of this sorbet felt so apt for St. Patrick's day, that it just fueled my thought of posting this recipe, no matter what! So... here I'm, sharing the Cucumber Lime Sorbet :) Due to high temperature all day, it was very hard to keep sorbet out for pictures. Everything was melting so quickly! So, I have taken a pretty random and rough shots. However, I can tell you, the taste of this sorbet is very refreshing and delicious! 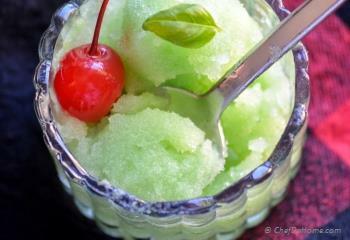 Almost like a chilled glass of limeade, served with muddled cucumber and fresh basil, over the ice, on a hot summer day!! refreshing! I don't own an ice cream machine. 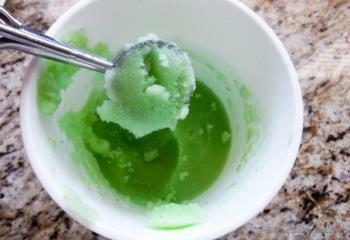 So, this sorbet, and all of my frozen desserts, especially ice creams, frozen yogurts, and sorbets are made with old classic freezing techniques :) Part-freezing and blending to break ice crystals.... and Voila! every time perfect texture! Desserts, that too frozen, and diet!! Are you out of your mind, Savita?! I know what you mean! but , trust me, for this dessert we can actually talk about diet. :) It does have sugar, but no corn syrups or artificial sweeteners, at least! Plus you can replace sugar with agave if you prefer. I suggest you make it today!! 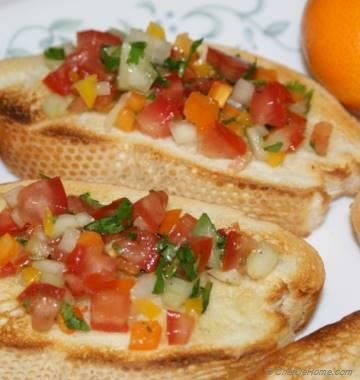 Or if it is still cold in your area, bookmark this recipe and make it first thing when sun starts shining bright! Also, I'm sure you will like these, kids-friendly, super healthy, my kind-a sweet treats! Smart Swap You can also make this sorbet with mango or kiwi. 1. Boil half cup water with sugar until sugar has melted and set aside. 2. Blend cucumber in food processor or smoothie blender with basil, lime juice and zest to a fine puree with remaining half cup of water. 3. Once sugar and water mix has cooled. 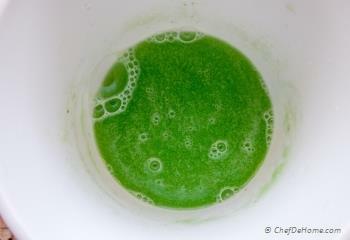 Mix it in cucumber mixture with one drop of green color (if using). 4. Leave mix in freezer to cool for 20 minutes or until semi-frozen. After 25 minutes, pour in blender and blend until ice crystal are very fine. Refreeze until ready to use. 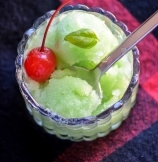 For finer sorbet consistency, repeat blending one more after 25 minutes and then freeze fully. If using Ice Cream Machine, pour mix in jar and churn per manufacturer instruction until nice and think. Then freeze until ready to use. 5. Take out of freezer 5 minutes before serving. 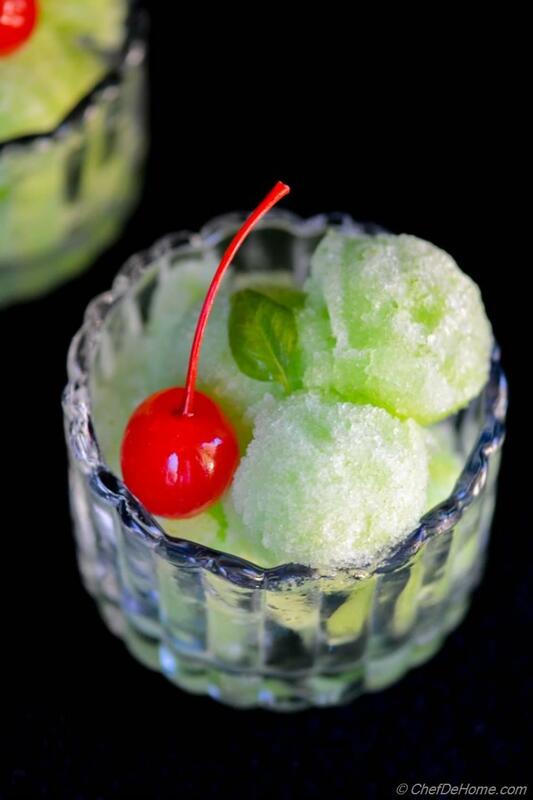 Scoop into serving cups, garnish with basil and cherries, and serve immediately. Sorbets melt pretty quickly. Keep serving cups in refrigerator until ready to serve to the guests! This was very good. I had ladies over for lunch and it was a big hit. I did not add the food coloring or the cherry. It was not semi frozen in 20 or 40 minutes, at 40 just the edges of the dish it was in. I did stir it with a wink when I took it out. I would absolutely love this! 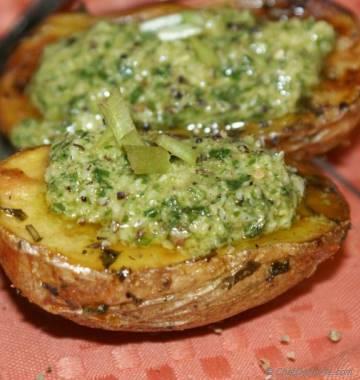 Anything with cucumber and basil, especially. And I can imagine the nice tartness from the lime. 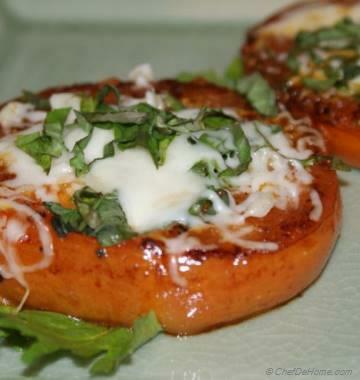 Great recipe, Savita! Annie, the tartness of lime with fresh cucumber is very addictive! :) thank you so much for stopping by! This looks so refreshing! Perfect for a hot summers day. Dannii, thanks! 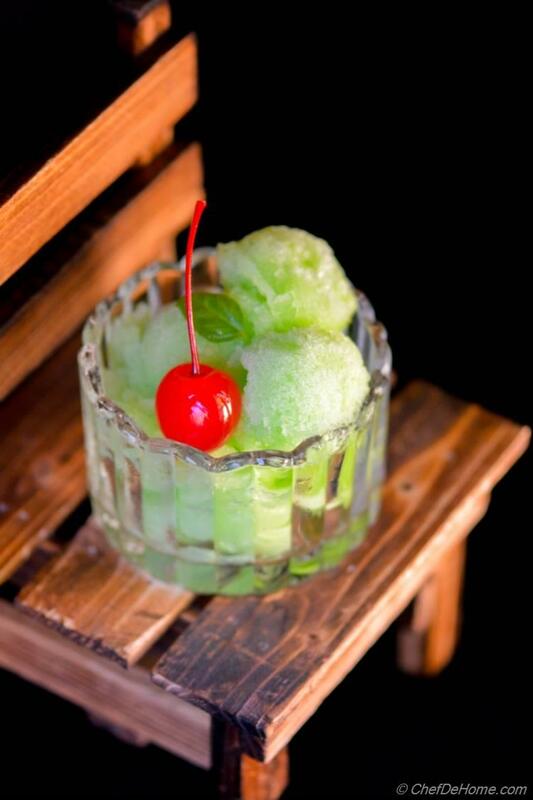 true, this sorbet is perfect treat for hot summer day! Love this sorbet and awesome clicks too!! I love this Savita, such pretty color and gorgeous pictures! :) pinned! Manali, thanks! I'm glad you like it! Also, thanks for the pin dear! thanks, Ritu! Sorbet was indeed very delicious! 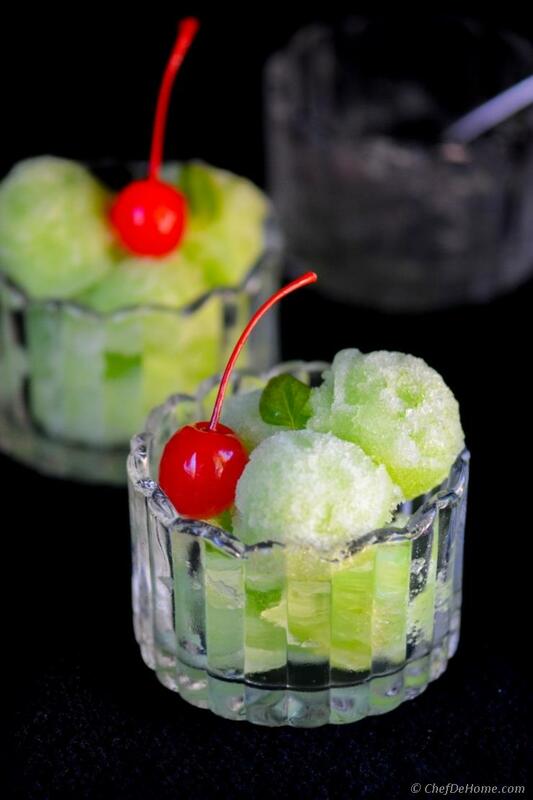 Aww..this is too good and different,sorbet, need to try this one Savita. Jeena, sure! please do try, let me know how you like it!